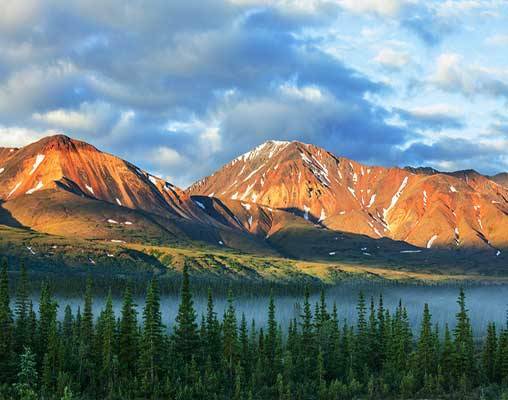 Enjoy this trip from inland Fairbanks to the southern city of Anchorage that takes you through Alaska's lush landscape full of beauty, history and heritage. 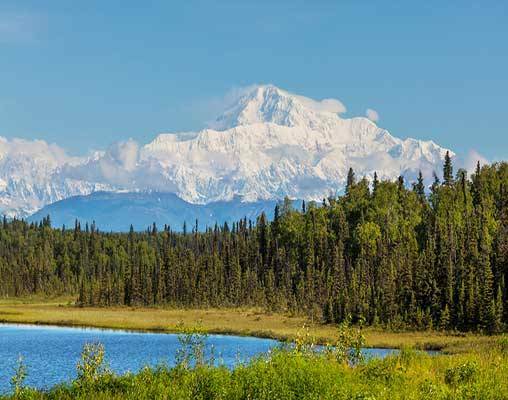 Explore Alaska on this refreshing 7-day escorted tour. Begin your journey in Alaska's second-biggest city, Fairbanks. Enjoy time on your own to explore this dynamic city, and wrap up the evening with the stunning view of the Northern Lights. 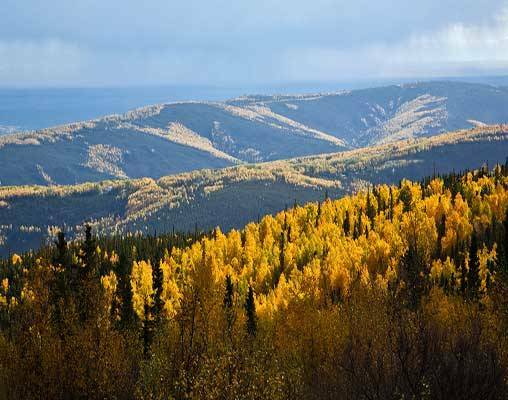 A museum visit, a tour of the Alaska Pipeline and a cruise down the Chena and Tanana Rivers gives you ample opportunity to explore this "Golden Heart City." 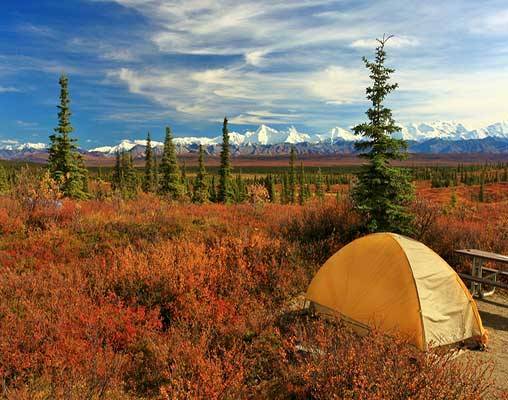 Next, visit Denali National Park, a 6-million acre land of stunning beauty that's filled with wildlife. With a backdrop of North America's tallest mountain, this nature preserve offers many ways to explore the area. You'll have free time to hike, sightsee via small plane or helicopter, or if you visit during winter, try out a dogsled excursion! Your tour continues with a ride on the Alaska Railroad down to Anchorage. 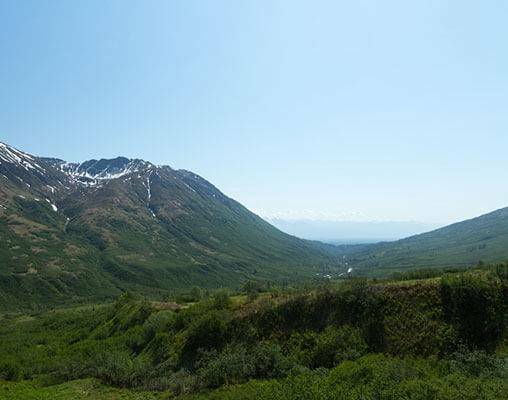 Watch the rugged landscape sail by your window and capture amazing photographs of the Mat-Su Valley. 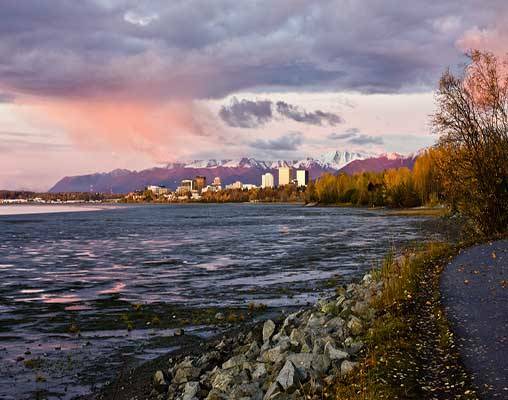 When you reach Anchorage, you get a new glimpse of Alaska as you visit this city sparkling alongside the waters of the Cook Inlet. Tour the historic downtown district and visit the Alaska Native Heritage Center to learn about this history of the area. Wrap up your trip with an authentic Alaskan style meal, as you bid farewell to your fellow travelers. Welcome to Fairbanks! Upon arrival, transfer to your hotel. Depending on your arrival time you may want to take a chance to explore Alaska's second largest city. Overnight Fairbanks. Your tour ends with a transfer to the Anchorage Airport for your flight home. Hotels include the Rivers Edge Cottages, Denali Bluffs, and Clarion Suites Downtown. 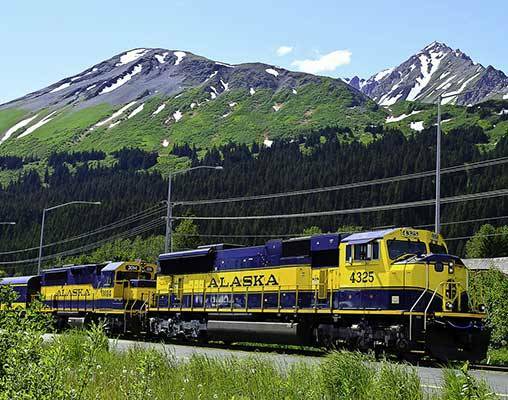 The Alaska Railroad extends from Seward and Whittier, in the south of the state in Alaska, to Fairbanks, and beyong to Eielson Air Force Base and Fort Wainwright. It carries both freight and passengers throughout its system. The Railroad has a mainline over 760 km and is well over 800km including the secondary branch lines and siding tracks. + Vacations By Rail can supply connecting rail from your closest Amtrak. Click here to view testimonials for Alaska Explorer. Exceeded my expectations … Everything was excellent! I just wanted to send you a short note to let you know that our parents, Jacob and Annie are home from their trip to Alaska. They really enjoyed themselves even seeing MT McKinley 100% without a cloud cover. I understand that about 10% of visitors see this, according to the tour guide. They really enjoyed the train ride from Denali to Anchorage. According to our mother, she had no problems sleeping even though Dad insisted on keeping the curtains open during the night hours of daylight! They were able to panhandle for gold, collecting about $40 between the two. They also saw some of the wildlife that Alaska is known for. They did not report any issues to us concerning the Tour package or the accommodations that you helped to put together. In fact, they reported the opposite, that everything went smoothly. I want to thank you for assisting me and my family in making this happen for them, a chance of a lifetime for our parents. Enter your details below if you would like to be notified when 2020 dates and prices are available for Alaska Explorer.